Draft: 2006, Kansas City Royals, 1st rd. Full name is Luke Anthony Hochevar (pronounced: HO-chay-vur)...resides in Knoxville, Tenn., with wife, Ashley...the couple has two daughters, Laney and Lucy Jane...Graduated from Fowler (Colo.) High where he was a standout in both baseball and basketball...a three-time All- State selection in baseball...posted a 1.19 ERA with 97 strikeouts in 47.0 innings as a senior while slugging 13 home runs with a .622 average and 38 RBI...was 7-0 with a 0.88 ERA as a junior, striking out 96 in 47.2 innings...At Fowler, was also the Division 2A Player of the Year and an All-Colorado selection in basketball, averaging 22.0 points, 10.5 rebounds and 7.6 blocks per game as a senior...Selected in the 39th round by the Los Angeles Dodgers in 2002, but chose to pitch at Tennessee...also selected 40th overall by the Dodgers in 2005, but did not sign...A three-year standout at the University of Tennessee, finishing his career with a 25-10 record and a 3.05 ERA in 51 career appearances...his 287 career strikeouts ranked second in school history when he declared for the draft... was the first-ever No. 1 overall pick from the University of Tennessee...Following his 2004 season, anchored Team USA at the World University Championship...As a junior in 2005, went 15-3 with a 2.26 ERA in 19 starts (139.2 IP, 104 H, 46 R, 35 ER, 54 BB, 154 SO) in helping lead the Vols to the College World Series...following the season, he was named a consensus first-team All- American by Baseball America, Louisville Slugger, Sports Weekly and the NCBWA...he was the winner of the Roger Clemens National Pitcher of the Year Award and was a finalist for the Golden Spikes and Brooks Wallace awards, won by Royals' 2005 1st-round pick Alex Gordon...In 2006, was named the Male Amateur Athlete of the Year by the Tennessee Sports Hall of Fame...Father, Brian, played professional basketball with the Denver Nuggets in 1979...mother, Carmen, played college basketball and volleyball at Southern Colorado...sister, Brittany, was a two-time All-American at Long Beach State and now plays professional volleyball...younger brother, Dylan, pitched at the University of Tennessee and Tusculum College (Tenn.)...Participated in Royals Caravans (2008-11) and FanFest (2008-11, 2013-15)...he and his wife, Ashley, have also hosted the Challenge Your Fashion fundraiser…he also participated in Toys of Summer events and the PLAY clinic. Returned to the big leagues after missing the entire 2014 season due to 'Tommy John' surgery…made his first big league appearance of the year on May 7 after starting the season on the D.L...Totaled 49 appearances, going 1-1, with a 3.73 ERA (21 ER in 50.2 IP) with 16 walks and 49 strikeouts...Posted a 1.38 ERA (4 ER in 26.0 IP) in 23 outings at Kauffman Stadium…had a 6.20 ERA on the road...Picked up his first win in nearly 23 months on August 19, in Cincinnati, tossing 1.2 perfect innings in a 4-3 win…his previous win came on September 20, 2013...He collected a save on August 11 vs. Detroit, tossing 2.2 spotless frames to close out the 6-1 win…marked his first save since August 8, 2013...Had 13 straight scoreless outings, which spanned 13.2 innings between June 23 and August 3…during the stretch he struck out 14 and held opponents to a .133 (6-for-45) batting average...He also had a 1.08 ERA in one-run games, holding the opposition to a .230 batting average in those situations...Dominant in August with a .186 opponents' batting average and a 1.54 ERA (2 ER in 11.2 IP) in 10 appearances...Made nine scoreless appearances out of the bullpen, earning a pair of victories…became the ninth Royals pitcher to record two wins in a single postseason...Posted a 0.66 WHIP, the lowest by a KC hurler that threw at least 10.0 innings in a single playoff season…his ratio topped Wade Davis' 0.70 WHIP during the 2014 postseason...Made four appearances during the World Series…earned the win in Game #5, tossing 2.0 hitless innings...Also picked up the win in Game #4 of the American League Championship Series, allowing one hit in 1.1 frames...Held left-handed hitters to one hit in 13 at-bats (.077) during the postseason…righties went 5-for-24 (.208). Luke injured his elbow in Spring Training and missed the entire season after undergoing "Tommy John" surgery in mid-March...Signed a two-year contract with a mutual option for the 2017 season on December 4. Luke made a successful transition to the bullpen after five seasons in the rotation, establishing himself as a reliable set-up man. Ranked third in the American League in opponent batting average (.169) and sixth in ERA (1.92) among hurlers with at least 60.0 innings pitched. Tied for sixth among A.L. relievers with 82 strikeouts, while his 10.49 strikeouts per 9 IP ranked sixth in franchise history (minimum 60.0 IP). Became the first Royals pitcher to face five hitters in a game and strike all of them out, September 10 at Cleveland. Posted two extended scoreless stretches, first with 17.2 innings from June 23 to August 3, then 12.2 innings from August 24 to September 16. Recorded first career save on May 13 at Angel Stadium. Luke struggled to find consistent success and ended up losing a career-high 16 games, the second-most in the Majors...Recorded a career-high 32 starts, 144 strikeouts and 7.0 strikeouts per nine innings...his 2.36 strikeouts-to-walk ratio was also a career best...Allowed at least 5 earned runs in 11 of his 32 starts, totaling 74 earned runs over 48.0 innings (13.88 ERA)...in his other 21 trips to the hill, Hoch surrendered just 44 earned runs over 137.1 frames for a 2.88 mark...Matched up with 2007 first-overall pick David Price on August 21 in St. Pete, matching zeroes with Price through 8.0 innings with Hochevar allowing just 1 hit...KC prevailed, 1-0, in 10 innings...joined Zack Greinke (8/30/09 at SEA, 9 IP, 1 H) as the only Royals pitchers to toss at least 8 innings of 1-hit ball since 1997. Luke set career highs in wins, starts, innings, strikeouts and quality starts (16). ... Had a breakout second half, posting a 6-3 record with a 3.52 ERA in 12 starts, pitching at least 6.0 innings in 11 of the 12 starts ... held opponents to a .222 average, the sixth-best mark among starters in the league. ... Pitched deeper into games, lasting at least 6.0 innings in 25 of 31 starts and at least 7.0 innings 14 times. ... Made his first career Opening Day start on March 31 vs. the Angels, dropping a 4-2 decision. ... Retired 31 straight hitters from April 15 to April 20, falling two batters shy of Steve Busby's club record. ... Was 2-1 with a 2.18 ERA in 3 September starts before being shut down due to a innings limit. 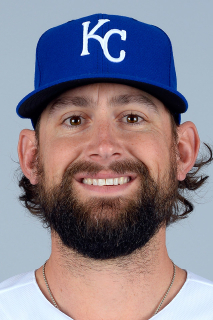 Luke missed significant time in 2010 with a right elbow sprain, only making 18 appearances, including 17 starts,for the Royals....Was placed on the 15-day D.L. on June 16 (retro to June 12) with aforementioned right elbow sprain and transferredto the 60-day D.L. on September 1...was returned from the rehab assignment and reinstated from the D.L. onSeptember 3...made a pair of rehab starts for Omaha (AAA), including starting the final game at historic RosenblattStadium on September 2....Was just 2-4, but compiled a 3.32 ERA in 9 home starts...was 4-2 with a 6.85 ERA in 9 games (8 starts) on theroad....Posted his third career complete game in a 9-3 win at Cleveland on May 20. Needed only 80 pitches to beat Cincinnati, 4-1, on June 12 for his first professional complete game...he was justthe second pitcher in the last 4 seasons to toss 80 or fewer pitches in a 9-inning complete game (Colorado's AaronCook, twice) and was 1 of 5 pitchers since 2000 to accomplish the feat...the 80 pitches were the fewest by a KCstarter in a 9-inning complete game since STATS, LLC began recording pitch counts in 1988...Was voted Royals Pitcher of the Month for June, going 3-1 with a 2.94 ERA in 5 starts...his .174 opponent battingaverage in the month was the best in the A.L., the third-best in baseball and the second-best all-time among Royalshurlers in June (Ken Wright, .160 in 1973)...Struggled with the big inning, as he was scored upon in 51 total innings in 2009...of those 51, the opponent put upa crooked number 26 times, including seven 3-run frames, fi ve 4-run, two 5-run, one 6-run and one 7-run...84 ofhis 109 total runs (77%) allowed came in these "big innings"...Hochevar's 13 strikeouts on July 25 vs. Texas were the most K's by a KC hurler since Kevin Appier also whiffed 13on August 29, 1996...Luke was the eighth Royals pitcher (10th time overall prior to Zack Greinke's record setting15 K's on August 25) to reach 13 or more K's...Luke was also the fi rst Royals pitcher ever and 15th different hurlerin baseball since 2000 to record at least 13 strikeouts while not issuing a walk...he teamed with Zack Greinke (10K's the previous evening) to become the fi rst twosome to record double-digit strikeouts in back-to-back gamesfor KC since October 2-3, 1993, in Texas when Tom Gordon and Kevin Appier each fanned 10...Struggled severely in the second half of the season, going 1-10 with an 8.21 ERA (72.1 IP, 66 ER) in his final 13starts...Snapped a 9-start winless streak on September 18 in Chicago, recording his fi rst career shutout in an 11-0 victory...facing just 2 over the minimum, Hoch gave up 3 hits, all singles (2 of the infi eld variety), and walked 1. Luke saw his fi rst extended time at the big league level, making 22 starts in his rookie season for the Royalsafter opening the season as the Omaha Opening Day starter...Received an average of 3.56 runs per nine innings of work over his 22 starts, the sixth-lowest support in baseballand the second-lowest in the A.L. (Smith-OAK) among pitchers with at least 22 starts...Experienced success against right-handed hitters, holding them to a .244 average while lefties hit .314...Struggled with 2 outs, as opponents collected a .339 batting average overall and a .436 mark with runners inscoring position and 2 outs...Had control issues early, walking 32 batters through his fi rst 9 starts of the season (52.2 IP)...handed out just15 bases on balls the remainder of the season in 13 starts (76.1 IP), posting the ninth-best walks/nine inningsratio (1.77) in the American League from June 9-August 19...Made 3 starts for the Royals Triple-A affi liate to begin the season...recalled on April 20...Earned his fi rst Major League win in his second start of the season (third career Major League start) on April26 at home against Toronto...allowed 1 run on 6 hits in 6.0 innings in the 2-1 Royals win...Picked up his second straight win on May 3 at Cleveland, defeating defending A.L. Cy Young winner CCSabathia, 4-2...set a new career high with 6 strikeouts...later equaled on June 14 at Arizona...Tossed a career high 8.0 innings in a win on June 25 against Colorado...Enjoyed his tour through the senior circuit, going 2-0 with a 3.66 ERA in 3 starts in Interleague play...Dropped his fi nal 5 decisions over a span of 6 starts from July 21-August 19 before being disabled with a rightrib cage contusion...was transferred to the 60-day D.L., ending his rookie season, on August 24. Began the season with Wichita (AA) where he was 3-6 with a 4.69 ERA in 17 games (16 starts)...startedthe Texas League All-Star Game...led the Texas League with 94 strikeouts at time of promotion...Appeared on the U.S. squad in the Futures Game on July 8 in San Francisco...tossed a scorelessinning...Promoted to Omaha (AAA) on July 11 where he went 1-3 with a 5.12 ERA in 10 starts...Recalled from Omaha on Sept. 4...made his Major League debut in relief on Sept. 8 against the Yankees,tossing 3 shutout innings on 3 hits...walked 1, hit 1 and struck out 1...Made 3 relief appearances (9.2 IP, 8 H, 1 ER, 0.93 ERA) before starting the Royals season finale onSept. 30 against playoff bound Cleveland...suffered the loss, allowing 2 runs on 3 hits in 3 innings. Became the Royals first-ever No. 1 overall pick when Kansas City selected himin the June Free Agent Draft...signed on Aug. 4 by scouts Phil Huttmann andGerald Turner and Senior Director of Scouting, Deric Ladnier....Made his Royals system debut on Aug. 16 with Burlington (A)...tossed 2.0scoreless innings with 2 strikeouts against South Bend, including a strikeoutof 2005 No. 1 overall pick, Justin Upton...Made 4 appearances for Burlington with a 0-1 record and a 1.17 ERA...in 15.1innings, allowed just 8 hits and 2 earned runs...walked 2 and struck out 16. Was promoted to Class AA Wichita for the playoffs and made 2 starts, recordinga 1-1 record with a 9.82 ERA....Made just 3 starts in the Arizona Fall League with Grand Canyon before beingshut down with shoulder soreness...was 0-0 with a 8.64 ERA in 3 starts....Named by Baseball America as the No. 2 prospect in the Royals minor leaguesystem entering the 2007 season...also mentioned as having the Best Curveballin the system...named the 30th-best prospect in baseball by MiLB.com and the35th-best prospect by Sports Illustrated....Prior to the draft, made 4 starts for the Ft. Worth Cats in the IndependentAmerican Association...went 1-1 with a 2.38 ERA, allowing 20 hits and 6 earnedruns in 22.2 innings...walked 11 and struck out 34. November 5, 2016 RHP Luke Hochevar elected free agency. September 2, 2016 Kansas City Royals transferred RHP Luke Hochevar from the 15-day disabled list to the 60-day disabled list. Symptoms of thoracic outlet syndrome. July 28, 2016 Kansas City Royals placed RHP Luke Hochevar on the 15-day disabled list retroactive to July 25, 2016. Symptoms of thoracic outlet syndrome. May 7, 2015 Kansas City Royals activated RHP Luke Hochevar from the 15-day disabled list. April 9, 2015 Kansas City Royals sent RHP Luke Hochevar on a rehab assignment to Omaha Storm Chasers. December 4, 2014 Kansas City Royals signed free agent RHP Luke Hochevar. October 30, 2014 RHP Luke Hochevar elected free agency. October 30, 2014 Kansas City Royals activated RHP Luke Hochevar from the 60-day disabled list. August 28, 2013 Kansas City Royals activated RHP Luke Hochevar from the paternity list. August 25, 2013 Kansas City Royals placed RHP Luke Hochevar on the paternity list. September 3, 2010 Kansas City Royals activated RHP Luke Hochevar from the 60-day disabled list. September 1, 2010 Kansas City Royals transferred RHP Luke Hochevar from the 15-day disabled list to the 60-day disabled list. August 28, 2010 sent RHP Luke Hochevar on a rehab assignment to Omaha Royals. June 6, 2009 Kansas City Royals recalled Luke Hochevar from Omaha Royals. May 24, 2009 Kansas City Royals optioned RHP Luke Hochevar to Omaha Royals. May 11, 2009 Kansas City Royals recalled Luke Hochevar from Omaha Royals.